This book was not interesting. It ruined my views of Ron Swanson and will forever make me like the show slightly less. Horrible book. I don't have a problem with people having their own views but when you belittle other peoples' views, that I don't like. Didn't appreciate this book and bummed that I'm no longer a Ron Swanson fan. I couldn't finish this book. I thought it bounced around and often sounded like a lecture. I completely agree with the author and also have not yet found a better audio book. I loved it! Outstanding job Mr. Offerman, thank you for sharing your crafty and amazing life. I wish the best for you and keep on being you fine Sir. Just a manly read book about being an all American. I love it. I agree with everything. He is the bomb. Nick Offerman is one of my personal heroes. This book chronicles his upbringing and subsequent life experiences. With each story comes a lesson and an opinion that I can get on board with. If you are a fan, this is a great listen. If not, a fresh worldview that's both thought-provoking and entertaining. Enjoy. Great book. Though, you really need to be a huge Nick Offerman and/or Ron Swanson (of Parks and Recreation) fan to truly appreciate it and just simply "get it." Personally, I really respect Offerman's brutal honesty, wit, and general demeanor about life. Very old school in a new way … if that makes sense. 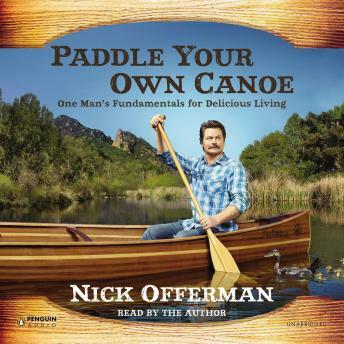 Thank you, Penguin Audio and Mr. Offerman (and Audiobooks.com)!